Drought conditions occur on a regular basis throughout the U.S. In 2002, Colorado and most of the western U.S. experienced one of the worst drought years in 110 years of records (see Doesken and Pielke's report). Drought conditions in Georgia have only recently been alleviated by recent rains (see the 3 April 2009 report). Drought conditions often have many economic impacts and the greenhouse and nursery industry is not immune. Severe droughts often trigger municipal watering bans and plant restrictions. How the greenhouse and nursery industry responds to these regulations requires an integrated approach requiring participating from all involved including growers, landscapers, property owners, water providers, and local government. The Green Industries of Colorado managed to assist growers, retailers, and contractors to survive the 2002 drought through a proactive establishment of Best Management Practices (BMPs) developed in collaboration with all parties. There are a lot of facts that are often not published when it comes to water use and water consumption. No one likes to see sprinkler systems in poor repair running water everywhere excpet where intended. Landscape irrigation is very visible to the public, but is that where our water goes? 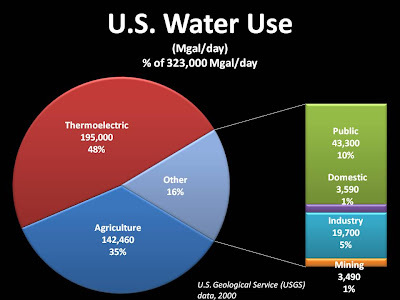 The U.S. Geological Service (USGS) last published an estimate of water use in the United States. The authors determined that the U.S. uses 408,000,000 per day. They estimated that 323,000,000 per day is from surface supplies. The largest single component (48%) of that water use is from the generation of electricity from thermoelectric generating stations (Fig. 1). Second is that from general agriculture (35%), which includes irrigated crops as sell as livestock operations. Public, domestic, industrial, and mining consume only 16% of the U.S. water. Of that only 46,890,000 gal/day include public and domestic water use. Outdoor water use is estimated to be between 40 and 60% of that use, which ranges from 18,756,000 to 28,134,000 gallons per day or 8.7% of all water used in the U.S.
During times of drought, municipalities often impose watering restrictions. These may range from voluntary restrictions to required watering schedules. Many of these restrictions may be draconian to the point where they may impact the landscape and related green industries. What is the impact of water restrictions? Do they serve the purpose for which intended? Are those restrictions developed from science or are they developed by bureaucrats operating from a sense of control rather than the impacts of their actions on all effected. During the late summer of 2002, Colorado was in the midst of coping with a devastating drought and dwindling water supplies. By mid-summer, most municipal water providers implemented some form of watering restrictions and the city of Fort Collins was not different. They implemented an even and odd address irrigation pattern with an attempt to ease water demands. After receiving a very revealing water bill, a Fort Collins area manufactured home park manager contacted me wondering why the park's water use was so high (Fig. 2). It is important to note some demographics of this 27 acre park. The park is 100% owner occupied and of those residents, 80% are retired. To maintain a quality environment, the park provides water with an expectation that the residents keep the grass green. 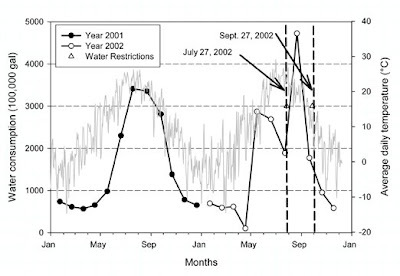 Looking at the months of May and into June 2002, you can see that the water use was on the decrease. During this period water restrictions were voluntary, but on 27 July, mandatory restrictions were enforced. It was at this point that water use increased to a level greater than the year prior. So why did the water use increase? It is simple human nature. When it is your turn to use a resource, you will use it whether you need it or not. So goes the fallacy of mandatory irrigation scheduling. The spring planting season is upon us and with any luck, this will be a great year for the green industries. With the economic downturn, many will be staying home and will want to have their own private oasis. Promote good gardening, promote good plants, and recommend proper watering practices.